Vital signs include body temperature, heart rate (pulse), breathing rate, and blood pressure. As you age, your vital signs may change, depending on how healthy you are. Some medical problems can cause changes in one or more vital signs. Checking your vital signs helps your health care provider monitor your health and any medical problems you may have. Normal body temperature does not change much with aging. But as you get older, it becomes harder for your body to control its temperature. A decrease in the amount of fat below the skin makes it harder to stay warm. You may need to wear layers of clothing to feel warm. Aging decreases your ability to sweat. You may have difficulty telling when you are becoming overheated. This puts you at high risk of overheating (heat stroke). You can also be at risk for dangerous drops in body temperature. Fever is an important sign of illness in older people. It is often the only symptom for several days of an illness. See your provider if you have a fever that is not explained by a known illness. A fever is also a sign of infection. When an older person has an infection, their body may not be able to produce a higher temperature. For this reason, it is important to check other vital signs, as well as any symptoms and signs of infection. As you grow older, your pulse rate is about the same as before. But when you exercise, it may take longer for your pulse to increase and longer for it to slow down afterward. Your highest heart rate with exercise is also lower than it was when you were younger. Breathing rate usually does not change with age. But lung function decreases slightly. Healthy older people can usually breathe without effort. Older people may become dizzy when standing up too quickly. This is due to a sudden drop in blood pressure. This kind of drop in blood pressure when standing is called orthostatic hypotension. Medicines that are used to treat health problems in older people can affect the vital signs. For example, the medicine digoxin used for heart failure and blood pressure medicines called beta-blockers may cause the pulse to slow. Diuretics (water pills) can cause low blood pressure, most often when changing body position too quickly. Chen JC. Approach to the geriatric patient. In: Walls RM, Hockberger RS, Gausche-Hill M, eds. Rosen's Emergency Medicine: Concepts and Clinical Practice. 9th ed. Philadelphia, PA: Elsevier; 2018:chap 183. Schiger DL. Approach to the patient with abnormal vital signs. In: Goldman L, Schafer AI, eds. Goldman-Cecil Medicine. 25th ed. Philadelphia, PA: Elsevier Saunders; 2016:chap 8. 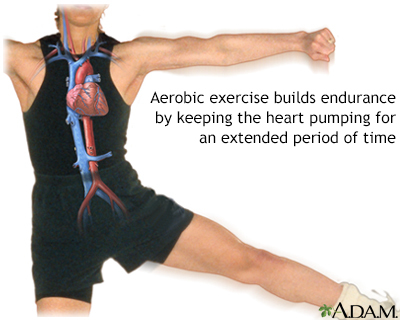 Aerobic exercise gets the heart working to pump blood through the heart more quickly and with more force than normal. As blood is pumped faster, it must be oxygenated more quickly, which quickens respiration. Aerobic exercise strengthens the heart and boosts healthy cholesterol levels. Low impact aerobics include walking and swimming. Running, tennis and dance are high impact aerobics. The carotid arteries take oxygenated blood from the heart to the brain. 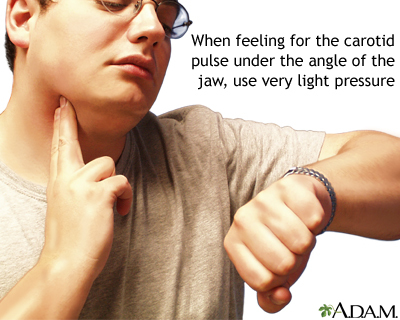 The pulse from the carotids may be felt on either side of thefront of the neck just below the angle of the jaw. This rhythmic beat is caused by varying volumes of blood being pushed out of the heart toward the extremities. Arteries carry oxygenated blood away from the heart to the tissues of the body. Veins carry blood depleted of oxygen from the same tissues back to the heart. The arteries are the vessels with the pulse, a rhythmic pushing of the blood in the heart followed by a refilling of the heart chamber. To determine heart rate, one counts the beats at a pulse point like the inside of the wrist for 10 seconds, and multiplies this number by 6. This is the per-minute total. Warming up before exercise and cooling down after are just as important as the exercise itself. By properly warming up the muscles and joints with low-level aerobic movement for 5 to 10 minutes, one may avoid injury and build endurance over time. Cooling down after exercise by walking slowly, then stretching muscles, may also prevent strains and blood pressure fluctuation. Blood vessels become less elastic with age. 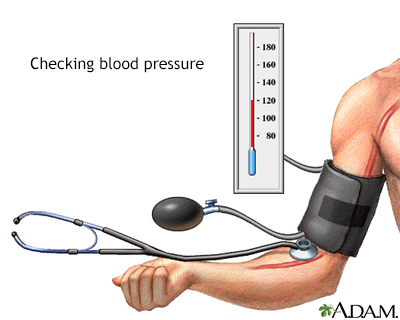 The average blood pressure increases from 120/70 to 150/90 and may persist slightly high even if treated. 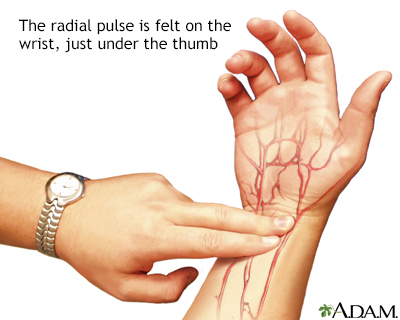 The blood vessels respond more slowly to a change in body position.